Plantains are a common fruit on our island. Plantains are also known as plátanos or bakbanaan and are closely related to fruit/dessert bananas. In general in the kitchen they are treated as vegetables much like fellow tropical produces such as potatoes, taro, breadfruit, yam and sweet potatoes. Plantains have been one of the staple sources of carbohydrates for larger populations in Asia, Oceania, Africa, and Central Americas for centuries, served in main courses. Plantain contains 2.3 g of dietary fiber per 100 g. Adequate amount of dietary-fiber in the food helps normal bowel movements, thereby reducing constipation problems. They also provide adequate levels of minerals such as iron, magnesium, and phosphorous. 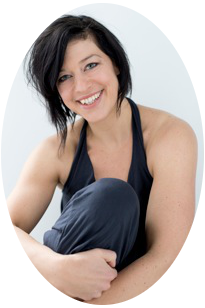 Magnesium is essential for bone strengthening and has a cardiac-protective role as well. 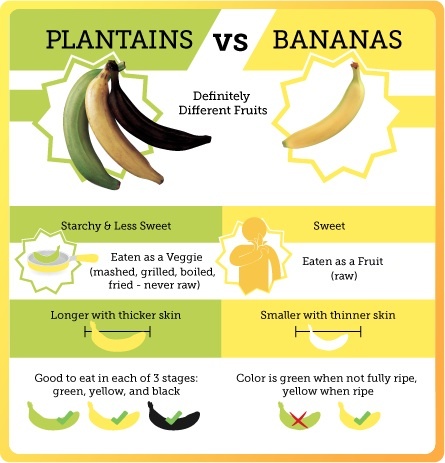 Although you can replace plantain by bananas in sweet dishes there are a couple of differences. 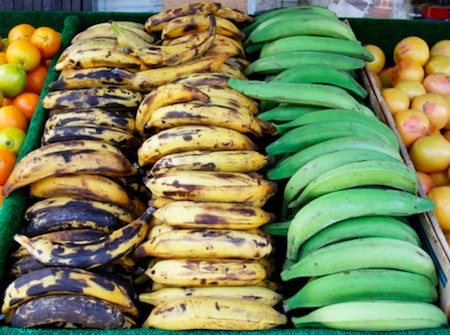 – Green plantain have more vitamin C than bananas. Consumption of foods rich in vitamin-C helps the body develop resistance against infectious agents and scavenge harmful oxygen-free radicals. However, boiling and cooking destroys much of this vitamin in plantains. – Plantains carry more vitamin A than bananas. Besides being a powerful antioxidant, vitamin A plays a vital role in the visual cycle, maintaining healthy mucus membranes, and enhancing skin complexion. – As bananas, plantains too are rich sources of B-complex vitamins, particularly high in vitamin-B6 (pyridoxine). Pyridoxine is an important B-complex vitamin that has a beneficial role in the treatment of neuritis, anemia, and to decrease homocystine (one of the causative factors for coronary artery disease (CHD) and stroke episodes) levels in the body. – Green Plantains: Starchy; good for frying and boiled in savory recipes. Raw green plantains can only be eaten after cooking. In one of my cooking classes my students asked me for ideas on cooking with plantain. Because a lot of people do know how to cook with the black ripe plantain (mainly in desserts, fried with cinnamon and sugar or in smoothies and icecream) I tried some things with the green and yellow plantain. 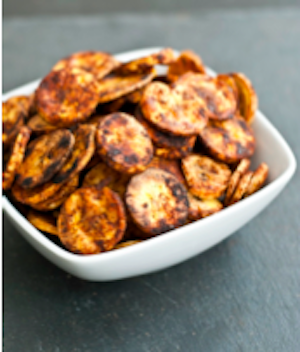 I want to share a Plantain flatbread recipe with you and a recipe to make Plantain bbq chips. Both are developed by me in preparation of my cooking class. I hope you will like them!!! – Pre-heat your oven to 375 degrees. – Get a 8 or 10 inch pan. – Place 1 tablespoon coconut oil in pan. – Peel your green plantain. Cut into slices and toss into your vitamix blender or any blender. – Next add in your water. – Next add in your sea salt. – Continue to blend till smooth. – Place your oiled pan into hot oven for a few minutes to get warm. 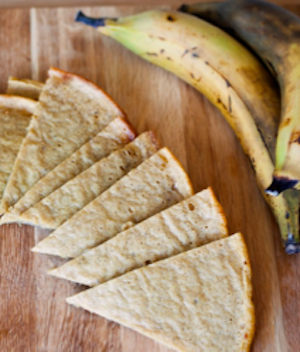 – Remove pan from oven and pour in your plantain socca batter. – Let cool a little before removing from pan. – Heat oven to 350 degrees. – Slice into thin slices. Depending on how thin you cut will determine final crispness. And you may or may not get some burnt ones if sliced little too thin. – Once plantain is all sliced toss in a large bowl. – In a small bowl, combine BBQ spice mix. – Spoon coconut oil over cut plantain. – And sprinkle plantain with bbq mix. Use it all. – Toss plantain with bbq mix so it all gets coated. – Place coated plantains on a baking sheet. – Bake 10 minutes and flip chips. – Bake another 10-15 minutes or under desired crispness is achieved.